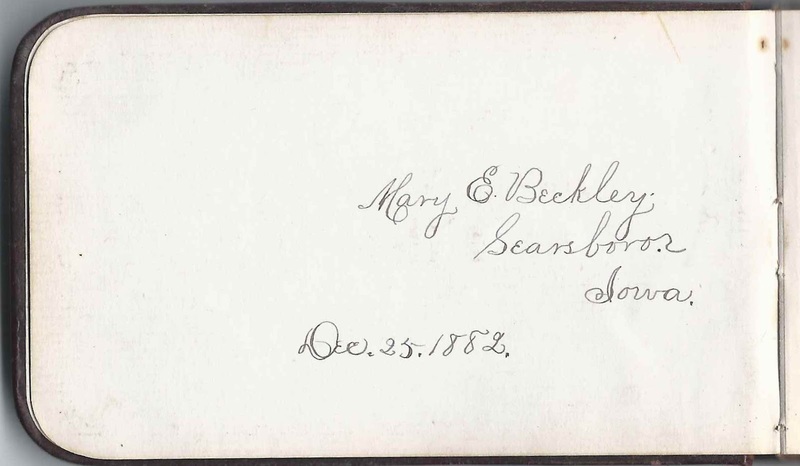 Above, the image of the cover of one of two autograph albums that belonged to Mary Elizabeth Bechly of Searsboro, Iowa. See the other album here. As you can see below, Mary used several spellings of her surname on the two albums: Bechly, Beckly and Beckley. Her father was born in Germany, and the original name may actually have been something else. The album is approximately 5-1/4" x 3" and contains the sentiments of 37 of Mary's relatives, friends and schoolmates. An alphabetical surname list and an alphabetical list of the signers, together with any personal information or family relationships they mentioned, appear at the end of this post. Mary Elizabeth Bechly was born May 7, 1868 in Poweshiek County, Iowa, the daughter of Freidrich August Bechly and his first wife Hepzibah Beulah (Dumville) Bechly, who were born in Germany and England, respectively. Hepzibah died less than a year after Mary's birth. Freidrich, or Fred, then married Lydia Maria Weesner, some of whose relatives signed pages in the album. Mary had a full brother Frederick William Bechly and, I think, six younger half-siblings. Mary's mother Hepzibah Beulah (Dumville) Bechly had three siblings, brother William and sisters Elizabeth and Jemima. Elizabeth Dumville married John W. Williams in 1846. They and their family were living in Washington, D.C. at the time of the 1880 Census. 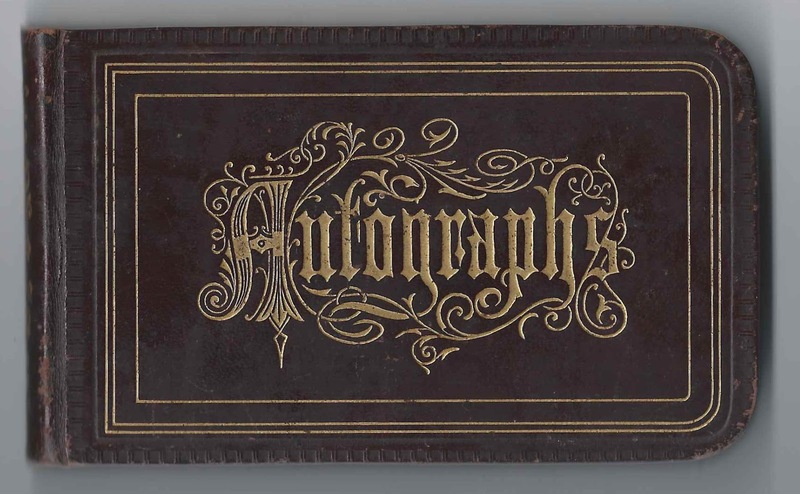 Son George Thomas Williams of Grinnell, Iowa, signed a page in this album on March 22, 1885. 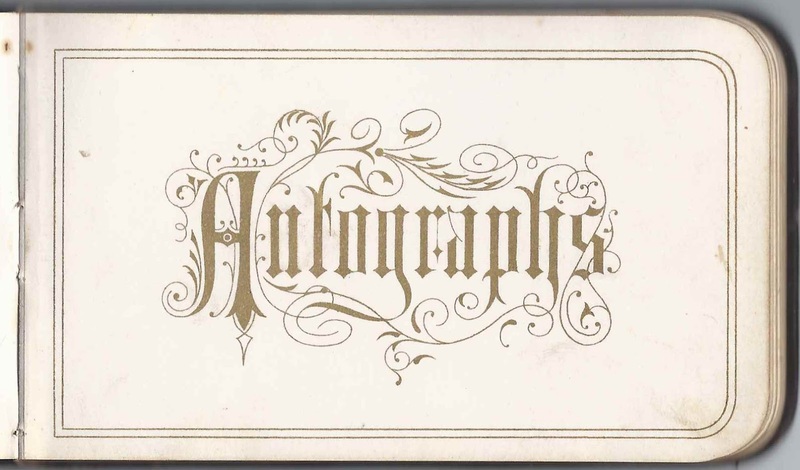 He also signed a page in the other album in 1881. 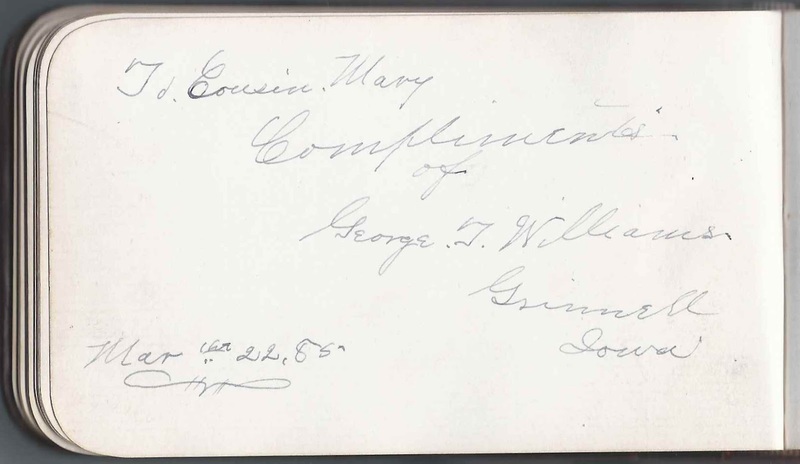 George's wife Lizzie Wiley Williams of Grinnell, Iowa, signed the right facing page on the same date. Hepzibah's other sister, Jemima Dumville, married James Henry Holme. They and their children were living at Benton, Missouri, at the time of the 1880 Census. 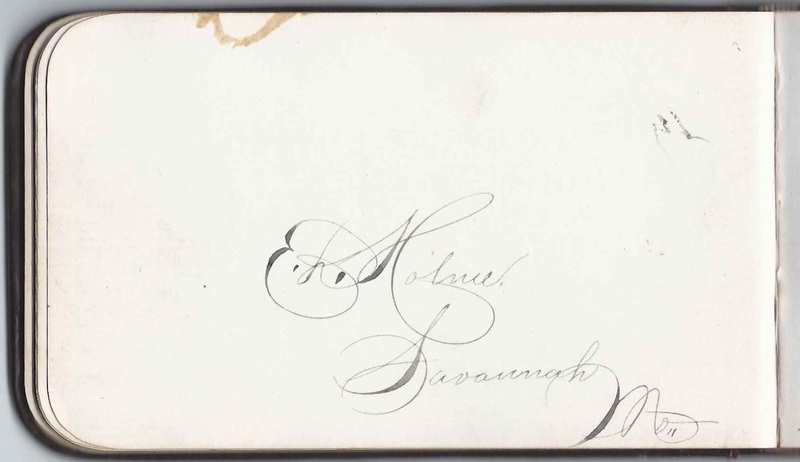 I believe the J. D. Holme who signed a page at Savannah, Iowa, on September 15, 1885, was Jemima (Dumville) Holme. Among the other people named Holme who signed in the album was E. D. Holme, who was presumably Jemima's son Edward Dumville Holme, apparently not yet a doctor. He also signed a page in the other album. On February 2, 1907 at Denver, Colorado, Mary Elizabeth Bechly married Joseph Perry Bankson, son of James M. and Mary Jane (Blankinship) Bankson. They farmed at Clarkston, Washington, and had at least one child, a daughter, born about 1914. Joseph died in 1955, and Mary in 1956. If you have corrections and/or additions to the information above or information on any of the signers listed below, please leave a comment or contact me directly. Grandma Allison, signed on March 15, 1887. She implies that her nation is Scotland and her dwelling place is Marton. Don't know if she was really Mary's grandmother or if "Grandma" was an honorific. R. A. Allison of Lynnville, Iowa, signed on March 16, 1887. Presumably Robert A. Allison (1855-1888), who was a minister in Iowa at that time. If he, he would live only a few months over a year more. T. Holme, signed at Rosendale, Missouri; Mary's cousin. Presumably Thomas Lincoln Holme, son of James Henry Holme and Jemima (Dunville) Holme, a sister to Mary's mother Hepzibah Beulah (Dumville) Bechly. E. D. Holme of Savannah, Missouri; presumably Dr. Edward Dumville Holme, son of James Henry Holme and Jemima (Dumville) Holme, who was a sister to Hepzibah Beulah (Dumville) Bechly, Mary's mother. Retta; Mary's cousin. Presumably Henrietta C. Holme, "Retta", daughter of James Henry Holme and Jemima (Dumville) Holme, who was a sister to Mary's mother Hepzibah Beulah (Dumville) Bechly. J. D. Holme, signed at Savannah, Iowa, on September 15, 1885. Presumably Jemima (Dumville) Holme, wife of James Henry Holme, and sister of Hepzibah Beulah (Dumville) Bechly, Mary's mother. M. E. Latham, signed at Searsboro, Iowa, on February 22, 1885; Mary's cousin Margaret Emily (Williams) Latham, whose husband Melville Amos Latham signed the overleaf. Margaret was the daughter of John W. and Elizabeth (Dumville) Williams. Elizabeth was a sister to Mary's mother. M. A. Latham, signed at Searsboro, Iowa, on March 21, 1885. Presumably Melville Amos Latham, whose wife Margaret Emily (Williams) Latham signed the overleaf. P. F. Latham, signed on February 12, 1885. Presumably Phoebe F. (Phillips) Latham, wife of Joel Latham. Phoebe's daughter Cora Latham signed a page in the album. Cora Latham, signed at Searsboro, Iowa, on January 29, 1885. Daughter of signer Phoebe F. (Phillips) Latham. Myrta Morgan, signed on April 24, 1887; Mary's cousin. Her mother was Martha Jane (Williams) Morgan, daughter of Elizabeth (Dumville) Williams, who was a sister to Mary's mother Hepzibah Beulah (Dumville) Bechly. Effie Morgan, Signed at Searsboro, Iowa, on April 24, 1887; Mary's cousin. Daughter of Loring W. Morgan and Martha Jane (Williams) Morgan, whose mother was Elizabeth (Dumville) Williams, a sister to Mary's mother. Her sister Myrtle, or Myrta, also signed a page. George T. Williams of Grinnell, Iowa, signed on March 22, 1885; Mary's cousin. He was George Thomas Williams, whose wife Lizzie Rebecca (Wiley) Williams signed the right facing page. George's mother was Elizabeth (Dumville) Williams, a sister to Mary's mother Hepzibah Beulah (Dumville) Bechly. 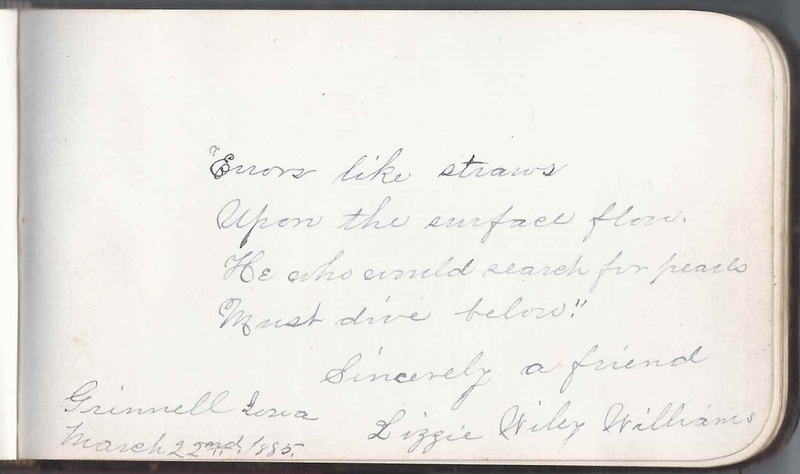 Lizzie Wiley Williams, signed at Grinnell, Iowa, on March 22, 1885. Her husband George Thomas Williams signed the left facing page.